Dalcarian (or Dal for short) regiment, first battalion. Västerbottens regiment (two amalgamated battalions). Närke-Värmlands regiment, 1st battalion (the second went on to the main infantry line). 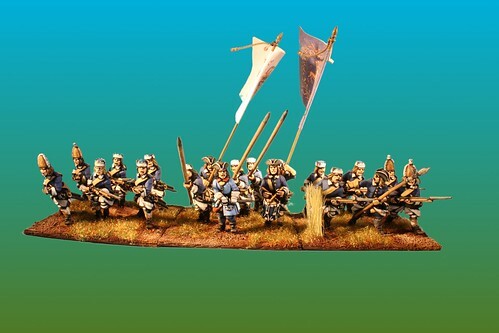 The figures are from Musketeer Miniatures, the flags are hand painted (Dalcaria), Little Big Men (Närke-Värmlands), or scanned from the Höglund book (Västerbottens). 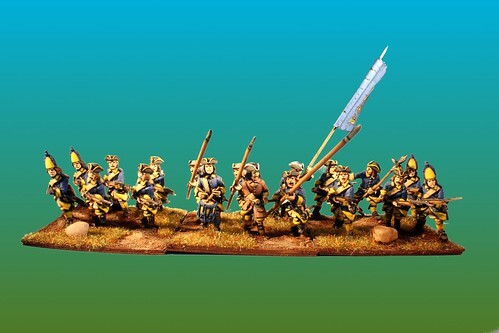 The figures for the next two battalions (Jönköpings and second battalion of the Dalcarian) have arrived last week, so they’ll be slotted in the painting queue soon. Really good looking painting, you rarely see figures from “The great northern war”. If you want some moore realism you could include some soldiers from Helsinge Battalion in the Dalecarlia regiment. They where thrashed in a previous battle and included in the crack Dalecarlia Regiment. Ps. Västerböttens should be spelled Västerbottens. thanks for the heads up on the Västerbottens spelling - I corrected it in the entry. 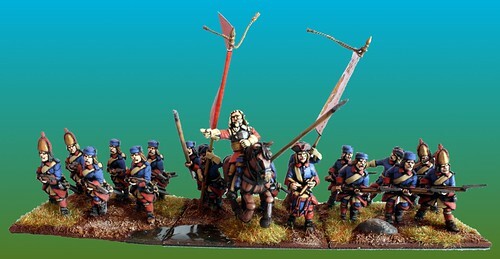 As to the various regiments that were disbanded after Lesnaya, at the time I painted these figures I did not have a reference as to which regiments were subsumed into which others. With the new Nick Dorell book, I now have one such reference so I might use it in further battalions. BTW, do you know what the deal is with the Dalecarlia / Dalcaria / Dal confusion? Do you know which name was used at the time? The Swedish name for the regiment is Dalregementet (the Dal regiment - Swedish has the definite article attached at the end of the noun ;)). Most regiments in the Swedish army were named after the province (län) they were raised in, like Sörmlands regementet, Västerbottens regementet, Närke-Värmlands, etc…. This regiment comes from the Dalarna * (“The Dales”) region, so gets shorted to Dalregementet. The other terms are funny English translations, often based on the Swedish term Dalkarlarna (“guys from the Dalarna”). The correct English translation would be the Dalarna or Dal regiment.